Beams of photons, neutrons and muons are essential tools to study materials at the atomic level. Synchrotron light allows scientists to solve the 3D structure of proteins e.g. the Chikungunya virus. In some pilot plants, electron beams are used to control emission of sulphur and nitrogen oxides. Proton and ion beams are well suited for the treatment of deep seated tumours. Radioisotopes used in PET-CT scanning are produced with accelerators. Many digital electronics rely on ion implanters to build fast transistors and chips. Replacing steel with X-ray cured carbon composites can reduce car energy consumption by 50%. Particle beams are used for non-destructive analysis of works of art and ancient relics. Accelerator technologies may bring the power of the sun “down to earth”, treat nuclear waste and allow for safer operation of reactors. Originally developed to investigate the fundamental laws of nature, particle accelerators accelerate charged particles to incredibly high speeds before colliding them at extremely high energies. 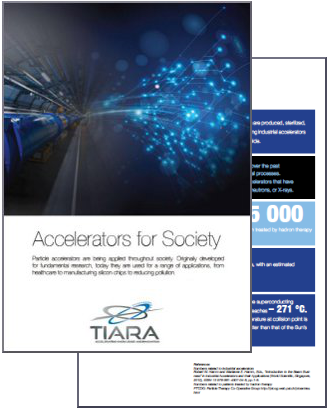 Today, accelerators are far more than a tool for fundamental research – their significant role in industry and society means that they have a very important, but often unseen, impact on our everyday lives. This website lets you explore the use of accelerators in industrial processes and applications that are relevant to each and every one of us. These applications include electronics, medical diagnosis, cancer treatments and studying ancient works of arts and air pollution. Particle accelerators are also being used to develop alternative energy sources. Interactive case studies around the website are great for finding out more about specific examples such as car manufacturing.